Urgent Care vs. Emergency Room: Where Should I Go? There was a time when the emergency room was the clear choice for anyone who needed immediate medical care during off hours. Today, however, urgent cares have made it easy for patients to receive prompt health care on weekends and holidays, and during evening hours. So, when it comes to urgent care vs. emergency room, how do you know which one to choose? This article explains. Urgent Care | A Less Expensive Alternative to the E.R. The first thing to note about urgent care is that it is not meant to replace emergency care. The purpose of urgent care is to help bridge the gap between your primary care physician and the emergency room. So, when your daughter comes down with a case of strep throat on a Saturday, or your son sprains his wrist riding his new skateboard on Christmas morning (when your primary physician is unavailable), you have an option other than the emergency room. Many people do not realize that choosing an urgent care over the emergency room for non emergency care can also save them money. According to the National Center for Health Statistics, the average emergency room visit costs around $1,049, whereas the average physician’s visit costs around $153. In most cases, choosing to go to an urgent care over the emergency room for these types of symptoms is the better choice. The emergency room is designed to handle just that — emergencies. The problem is that many people have difficulty distinguishing between an ailment or illness that warrants an emergency room visit and one that could be treated at an urgent care facility. If you are experiencing any of the following symptoms, it is recommended that you call 911 or go to the emergency room immediately. If you think you require emergency care, don’t second guess yourself. Call 911 or go to the emergency room immediately. However, if you are experiencing mild symptoms associated with a common illness or injury, FastMed Urgent Care can save you significant time and money! At the end of a workday, on weekends, and even on holidays, a FastMed medical professional is available to see you. 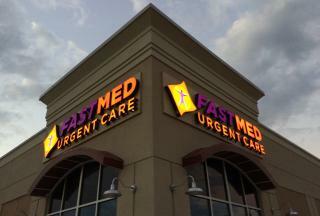 Find a FastMed near you today!